Click PLAY to Watch the VIDEO below and see Rick in Action. 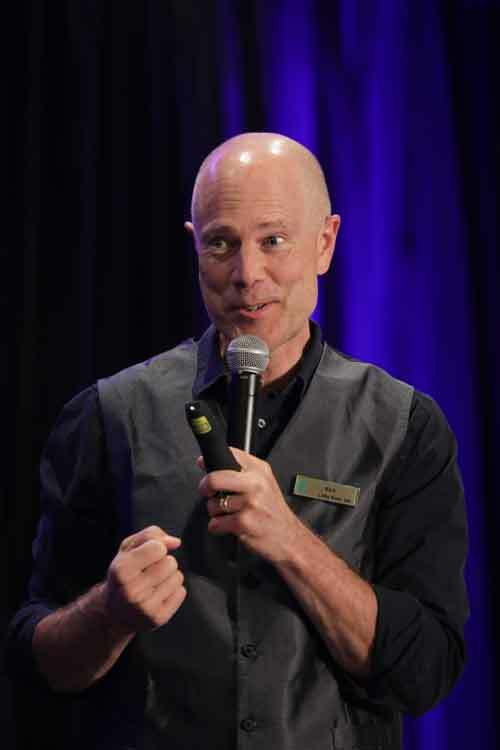 Rick is a speaker, author and entertainer par excellence who delivers a world-class presentation for meetings and events of all kinds. In the world of meetings where attendees have “seen it all” Rick is the ace in your meeting hand; a fresh, surprising and delightful experience they never saw coming. Rick is a legend in the world of events, having presented to over 1 million people in the last 20 years for more than 500 organizations you interact with everyday and countless associations, non-profits and small businesses across North America. Rick is known for providing an ultimate combination of hilarious clean comedy and fresh motivational content. The combination of the two will have your guests lined up at the book table to take home a reminder of Rick’s playful spirit and innovative thinking. Rick Lewis is one of those rare individuals who challenges the zombie-like 'norms' of this world. He's in a whole other stratosphere of thinkers and communicates his mind-expanding views in a fun way. I find reading his work enjoyable and relaxing, but more importantly for me it's been profitable! What he teaches has not only expanded my income, it’s also improved my marriage. I highly recommend you give his book your attention. If you are on a search for “something different” for your event, then Rick is for you. Rick is a highly skilled speaker, entertainer and author. He weaves these elements together in a unique way for every audience he encounters. Every “Rick Lewis Presentation” is customized to the individual client and event. Rick tailors his delivery to support your organizational objectives, to best engage your attendees, and to seamlessly flow with the rest of your meeting agenda. Rick of course has core material that he weaves into each presentation, but that content is applied uniquely in each case to help you achieve the audience outcomes you desire. Booking Inquiry * Would like to explore the possibilities. Ready to book.